Book N Gauge, the monthly Book Culture event, will feature Nze Sylva Ifedigbo author of the recently published collection of short stories, “The Funeral Did Not End’ and Atilola Moronfolu, author of Anatomy of Mirage. The event, in its sixteenth edition, will draw from the theme: “Unending conversations”. The event will explore how literature is fuelling never-ending conversations about issues that are dear to our hearts. In the boundless spirit of unending conversation, the 1t6th edition will also feature Nigeria’s premier spoken word Poet, Sage Hasson and Violin aficionado, Ernest Bisong. Book N Gauge is organised by the Pulpfaction Book Club, a group of literary-minded individuals driven by a passion to make reading hip again. The event is scheduled for the Saturday, 29th September 2012 at the Debonair Bookstore, Sabo, Yaba, Lagos. Nze Sylva Ifeigbo is an “Out-of-Practice” Doctor of Veterinary medicine, a writer with ample experience in Project Management, Creative Writing, Public Relations and Corporate Communications. He is an award winning essayist and author of the novella, “Whispering Aloud” and collection of short stories “The Funeral Did Not End”. Sylva Nze Ifedigbo represents an image of a young man, equipped to inform and discuss the socio-political issues. He has proven his mettle as an essayist on several media platforms, such as The Punch, The Nation, 234Next, Nigeria Village Square, Nigeria Dialouge, amongst others. He manages a weekly column on Daily TimesNG where he dispenses the medicine of logic and deep thinking to a wide range of issues. His blog bagged the 2010 Best Personal Blog by the Nigeria Blogs Awards. Nze, as he is fondly called by friends has contributed to different international literary Journals, amongst which are MTLS, StoryTime, Swale Life, Life As a Human, Sentinel Nigeria, and Saraba. Multi-faceted entrepreneur, writer and editor. She is the Publisher of Neighbourhood Magazine, a spoken word artist, and popular blogger on atilola.blogspot.com. Atilola Moronfolu plays an editing and advisory role for fellow writers and bloggers who are prepared to publish their books. Because of her style of writing, which borders on the reality of the societal ills, she has been described by readers and reviewers as a social commentator. She sometimes calls herself “The Character Thief”. She is also one of the leading spoken word voices in the country. She is the author of Antonyms of a Mirage, the now popularly trending short stories collection. Atilola is currently working on her second novel. Ernest Bisong also known as Emythang! is arguably Nigeria’s best violinist. Emythang’s control of the violin is phenomenal. This has endeared him to musicians and enthusiasts alike. He has performed as a multi-genre violinist in the United States of America, as well as parts of East Africa. As a violin Guru, he has worked with some of Nigeria’s best Producers and Artistes such as Cobhams, Wole Oni, Asa, Bez, Mode 9, to mention a few. Early this year, he featured in a Nollywood movie starring Ashionye and Dakore titled ‘Journey to Self’. He is currently recording a joint hip-hop album with IBK a.k.a spaceshipboi. Sammy Hassan is a pioneer and leader of a new poetic movement called Spoken Word. HE describes Spoken Word “…Giving poetry wings to fly”. Sage launched professionally into Spoken Word in 2005 and has since featured in different events such as HipHop World 2006, Big Brother, Word Up, Unchained Voices, amongst other social and corporate engagements. Sage Has.Son is his stage name. Sage has boldly released a 16 track spoken word album titled the “The Poet” and plans to wax more lyrical and poetic in subsequent releases. Sage is the quintessential “Poetushness”, and he is not alone, he is also a mentor to several upcoming Spoken Word Poets. He has also lent support to several creative events in the Spoken Word art industry. He strongly believes in the thrust that Spoken Word will be receive overreaching acceptance by Nigerians in the coming years. 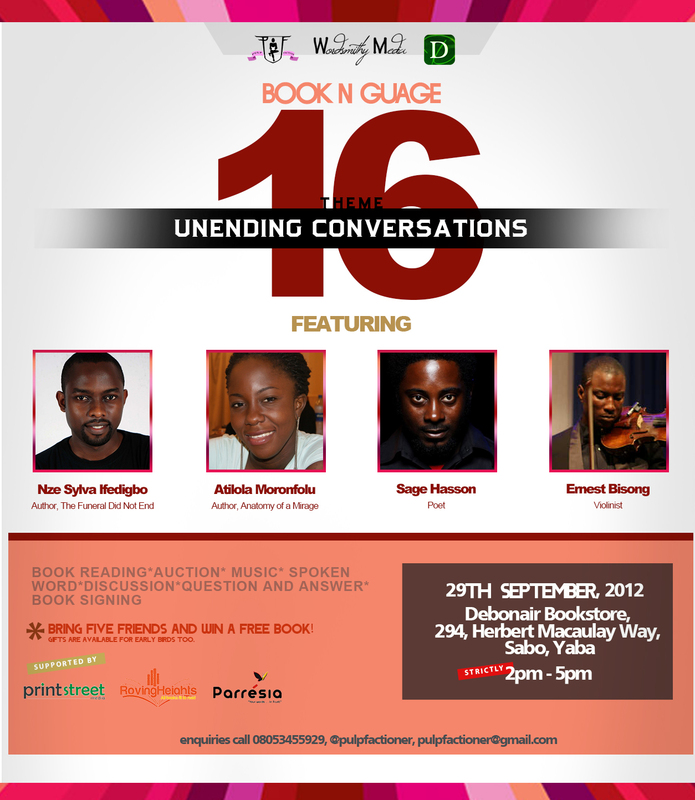 Book N Gauge 16: Unending Conversations, holds on Saturday, 29th September, 2012. It’s an avenue to connect, enjoy, relax, to meet people and to escape on the wings of words.